Adapting an immensely popular novel is never easy. Remember when you first saw Daniel Radcliffe as Harry Potter? It probably ruined all your original visions of the wizard-who-would-be-king and sent you complaining to the powers that be that you'd never accept those films as part of the Potter canon. Whilst the same level of fandom might not encircle Steig Larsson's 'Girl' books, Niels Arden Oplev's Swedish adaptation of the first of the trilogy, The Girl With The Dragon Tattoo, does carry on its back the pressure of bringing two popular characters of modern literature to the screen for the very first time. In casting Noomi Rapace as the titular Girl, Lisbeth Salander, Oplev is well on his way to having a successful venture, the charming actress completely transforming herself into a realistic depiction of the angst-ridden character with the mysterious past who hacks into computers and sticks it to sexist pigs as a day job. 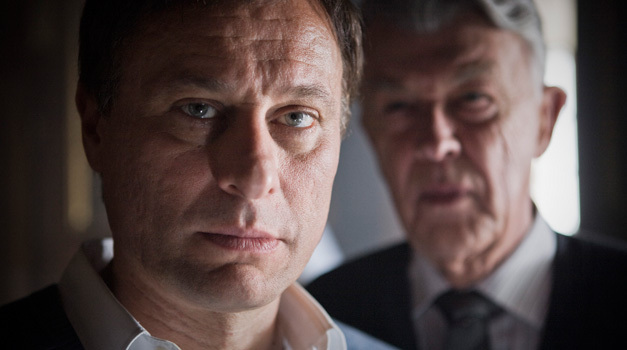 Unfortunately, there's another half to this equation in Mikael Blomkvist, played by Michael Nyqvist, a man who really fails to capture the easy charm and heady charisma of the character we all read and loved in Larsson's novel. Nyqvist is at best functional and at worst completely lacking in screen presence on several occasions, turning in a subdued performance that doesn't fit his character, the source or often, the action going on around him. If the casting is a mixed bag, at least as far as the leads are concerned, then happily, the plotting is much more successful. Some areas that are dropped or marginalised from the novel (Blomkvist's daughter) make perfect sense and tidy up some of the details which wouldn't have worked in a film, even if Oplev does give himself an extended one-hundred and fifty-two minutes to fit in everything he keeps. With that in mind though, it's difficult to see how the decision was made to all but eradicate the character of Erika Berger, a crucial cog which oils the Blomkvist/Salander relationship but which here, has a total of three very minor scenes. Despite these changes, newcomers to the series who enter with the film will still probably find the inflated running time hard to swallow, especially given the amount of time dedicated to visiting murder sites and creating montage shots of evidence in the final third, actions which seem to gain our duo little advantage in the overall scheme. Despite this, the screenplay by Nikolaj Arcel and Rasmus Heisterberg does do a good job of showing us what's going on, resisting the chance to reproduce Larsson verbatim and guaranteeing a safe and largely successful, if slightly flawed, first stab at adapting his work. The actress was pretty awesome, but otherwise, I thought this entire movie was pretty boring. I mean, when the thriller stuff came up, I just wanted them to get back to the characters, y'know? Agree about Rapace and I do think the thrillery stuff could have been executed much better. The 'hunting' of Blomqvist in the forest is a much bigger deal in the book than it is here. Really had a problem with Nyqvist which completely stopped me from enjoying it fully.